Spring is underway and summer is just around the corner. That means it is time to get outside and moving, and what better way than to hit the waves on one of the market’s top rated and quality designed paddle boards? Whether you are a coastal native or looking for a beachfront vacation, paddle boarding is a long-treasured past time that is a good starting point for boarding beginners. While the original practice of stand up paddle boarding can be traced back thousands of years, the modern iteration was developed in the early twentieth century in the waters of Hawaii. The sport involves standing on a long board and using a long paddle to navigate the waves. Of course, entering into this historic sport requires the right gear, and that is where we come in to help you make the best decision. Before we get into the best boards for your buck on the market today, let us talk a bit about the types of boards that are out there. 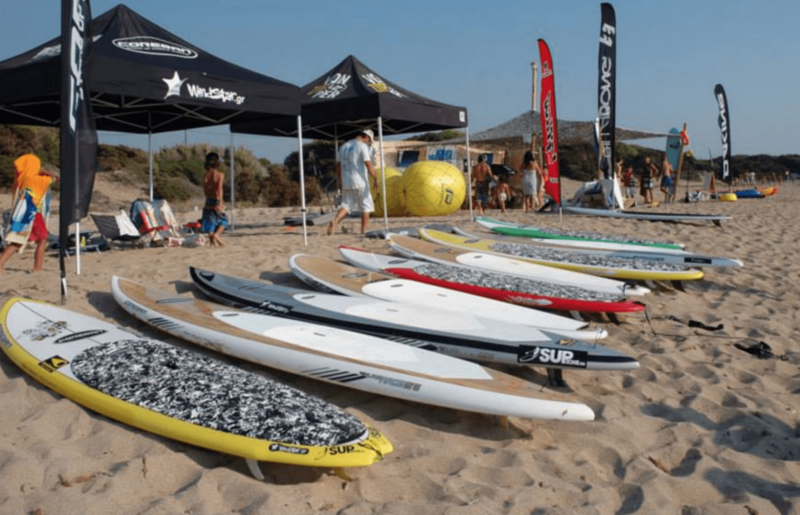 As we introduce you to some of the best stand up paddle boards available today, keep in mind the purpose that you need a board for so that you pick the optimal type. This flat water inflatable board runs at about 10.4″ x 32″ by 6″ and was specially designed to overcome some of the design flaws that exist with the standard 4″ thickness inflatable board form. 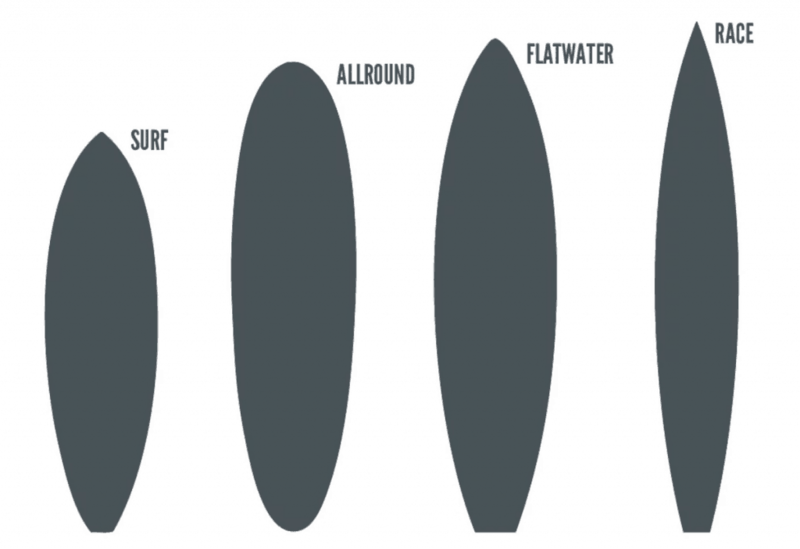 Inflatable boards have a tendency to sag in the middle of the board when you are out on the waves, which can affect speed and allow water to pool onto the top of the board. The Tower Adventurer 2 eliminates these issues with it’s 6″ thickness design made from military grade materials that makes it sturdier and gives it the ability to float higher in the water. The board can handle up to 400 lbs with no issues, and is easy to store and carry for when you are on the go. What does all this mean for the customer? Better stability at a fair price and a board that will last you for years to come. This type of board is great for general use, beginner use, and yoga. 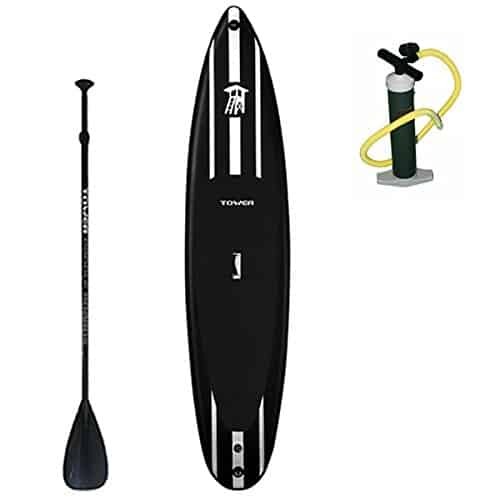 Another popular flat water board, the ISLE Classic Soft Top Stand Up Paddle Board is a hard paddle board made of durable polyethylene with a rigid expanded polystyrene (EPS) core. The board sizes at 10′ 8″ x 31″ x 5″, and can withstand up to 275 lbs. This is the ultimate board for beginners or those who are just looking to cruise the low waves, with an easy-grip surface and a smaller price tag. This ISLE Classic Soft Top board works best in smaller ocean swells or for paddling along the calmer surface of a lake or large pond. The stability and rigidity that this board offers makes it a great choice for giving younger children the opportunity to practice their skills, and it is wide enough to allow you to stand with them. Bic’s unique epoxy mix for this series of boards is designed to be 30% stronger than other hard boards without sacrificing weight or stiffness. In other words, the ACE-TEC Performer boards resemble the same weight and rigidity of other boards even though it is a tougher model. A perfect choice of flat board for the beginner or the experienced boarder. 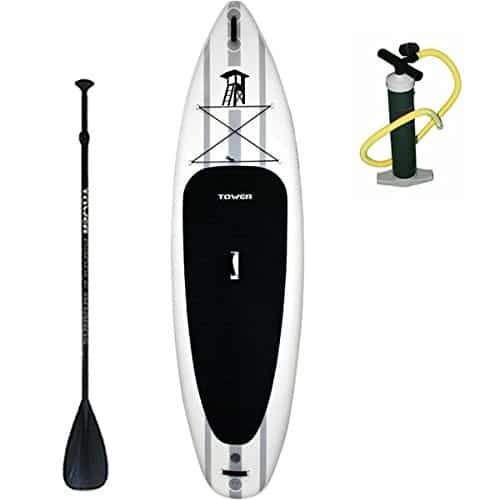 A high float ability and extreme stability are the trademarks of this inflatable paddle board. The PEAK Inflatable Paddle Board runs at 10’6″ x 31″ x 6″ and can withstand up to 300 lbs, which makes it almost the perfect size for flat boarders looking for a smooth and dry ride through the waves, or the yoga enthusiast looking for a sturdy base. 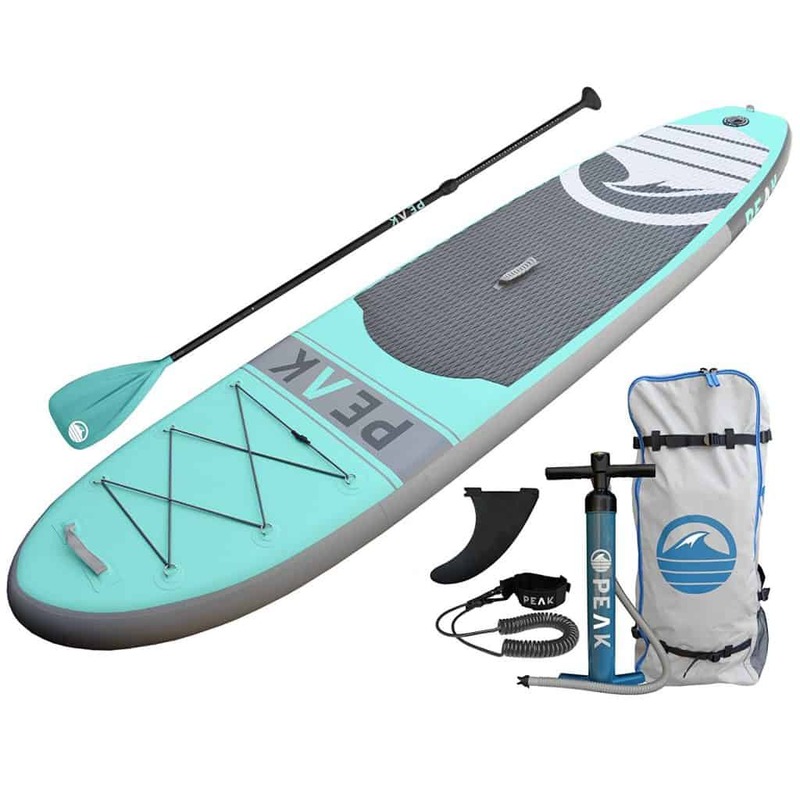 The PEAK Inflatable Paddle Board is made of a military grade PVC material that easily matches up with the stability and durability of modern epoxy hard boards. This is not the type of inflatable board that will have you sinking into the water due to thin materials and less thickness. The surface of the board has a strong anti-slip material to give you better grip while on the move, and it comes in a variety of colors, including: aqua, blue, red, and white. A solid all-around board that won’t break the bank. This board measures in at 11′ x 30″ x 6″ and can withstand up to 250 lbs. The style of the board boasts a more natural, tapered design that mirrors its surf board cousin rather than the more squared-off design that most paddle boards offer. The materials this board is made with are sturdy and give you the feel of riding on a hard board rather than inflatable, which means the rigidity of this board is one to be reckoned with. The size and style of this paddle board make it ideal for use as a fishing board. It is strong enough to hold you and your gear,the 6″ thickness means you won’t be wading in water on your board, and it is wide enough to allow for good foot positioning when preparing to cast or reel in a catch. 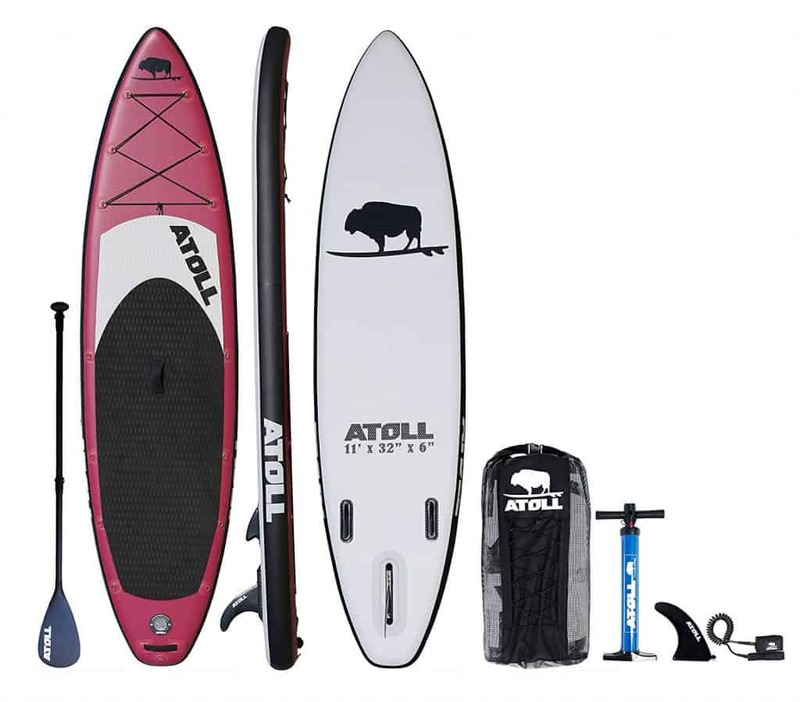 The Atoll Inflatable Stand Up Paddle Board is also great for general usage, though the tapered front might make it slightly too advanced for a beginner to properly control. Why the Atoll? It has 311 reviews with a 5 star rating from Amazon buyers! That is so hard to get. Moving into the racing arena of paddle boards, we once more return to the Tower brand, which is a proven name in the paddle board manufacturing world. Their iRace paddle board runs at 12’6″ x 30″ x 6″ is a pro at mastering choppy waters and propelling you across the waves at an accelerated rate. It is also the perfect board for experienced racers, as it is narrow and long enough to provide both speed and stability. This is an inflatable board made of military grade PVC material and drop stitch design that make it just as tough–perhaps even tougher–than the average hard board. 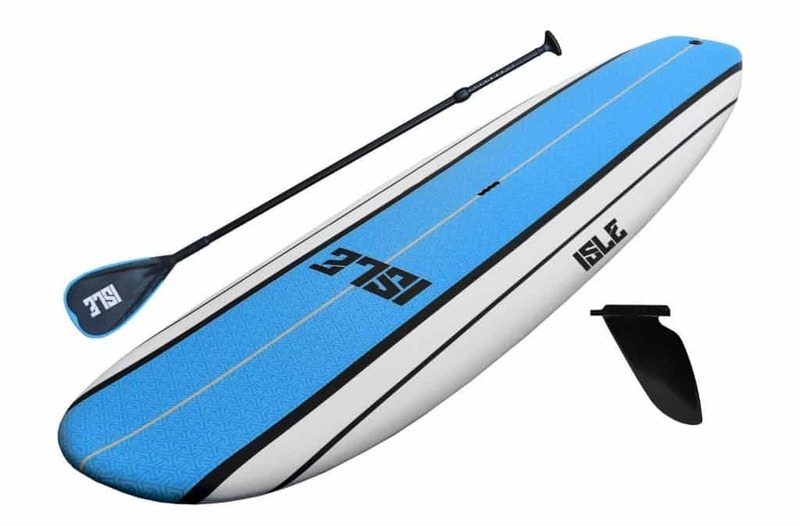 The 6″ thickness gives it just enough of a push to make it float higher than traditional inflatable boards, and its length makes it great for taller individuals who will appreciate the increased stability they will experience. This board can support up to 350 lbs. Surftech is known for its belief in developing some of the best board materials to use in their boards. The Surftech Generator is made of their TEKEFX material, which involves a lightweight EPS foam core, layers of high resolution fiberglass cloth, a layer of natural bamboo, and laminated with high quality polymer resin that makes it scratch resistant and long-lasting. This board is expertly designed to serve beginners looking for easy maneuverability or the experienced boarder looking for efficient glide and stability. The Surftech Generator paddle board is a hard board with heart, and its unique design and beautiful form makes is great for use in the waves as well as simple looking great as you make your way down to the surf. 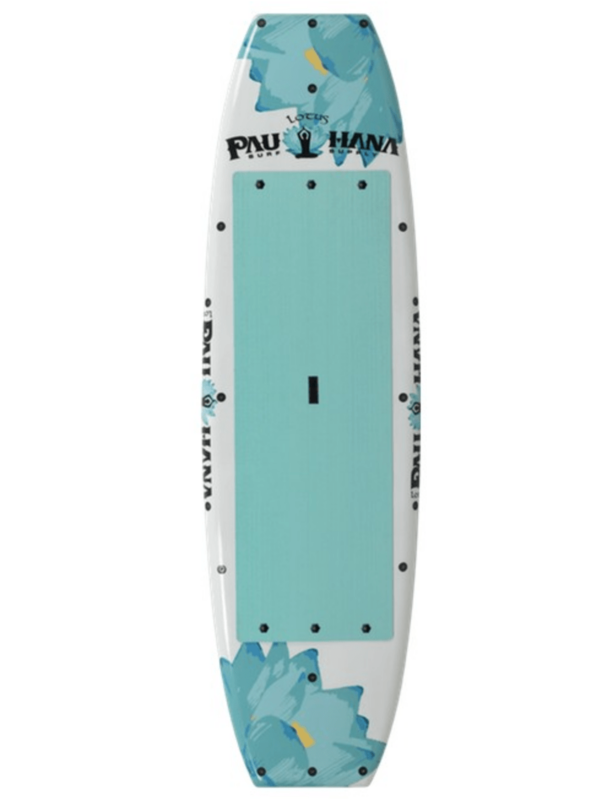 While any paddle board designed for flat water or all-around use can double as a solid yoga board, there is something to be said for the Pau Hana Lotus board that makes it inherently unique and beautiful in design. This 10′ x 34″ x 4.25″ paddle board can withstand up to 240 lbs and has an EPS foam core cradled by sturdy bamboo and then surrounded by layers of high-quality fiberglass and EVA padding to give you a solid, yet comfortable, ride. What is most unique and efficient about the Ocean Kayak Nalu Stand Up Paddle Board is the fact that is can double as both open kayak and paddle board, depending on what you need. This is truly an innovative design that gives the consumer more option and freedom in deciding whether they want to sit or stand as they glide down a lazy river, across a calm lake, or over the frothing waves. This board measures 12’6″ x 31″ x 6″ and can withstand up to 350 lbs. The Ocean Kayak Nalu board is perfect for the beginner who is not yet ready to commit to a paddle board, or the traveler who wants multiple means of getting out on the water. The board also has a convenient bow hatch and stern bungees for storage of essential goods for your trip. As a paddle board, the Ocean Kayak Nalu board is perfect for flat water boarding, is stable enough for a beginner, and long enough for taller individuals to easily ride. It’s tapered nose and sleek design also mean that it is adept at moving quickly through the water. Finding the right paddle board can be both a frustrating and yet wholly rewarding endeavor. Keep in mind that these are our personal opinions based off of experience, testing, reviews, and customer feedback. As I would love to send everyone to really expensive high-end paddle boards, that just isn’t always what people are after or want. Also, please keep in mind that we haven’t tried every board made as there are thousands out there these days. As we test more, we refine our thoughts and opinions. In the end, it is up to you and your specific needs that will decide which board is king. It is important to get out there and jump on a board yourself and just see how it feels to you. Get your feet wet, and enjoy a day in the sun on the water because that is what it is about in the end for us. The Best Paddle Boards Guide For You In 2019	Overall rating:	5	out of 5 based on 5	reviews.